(2013). pH and Properties of Synthesized Barium Hexa-Ferrite by Co-precipitation Method. International Journal of Bio-Inorganic Hybrid Nanomaterials, 2(4), 491-494.
. "pH and Properties of Synthesized Barium Hexa-Ferrite by Co-precipitation Method". 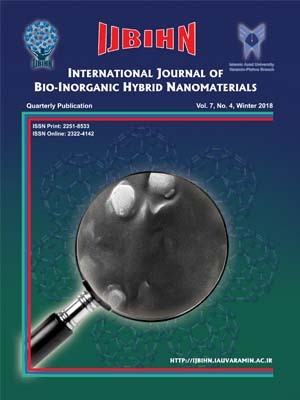 International Journal of Bio-Inorganic Hybrid Nanomaterials, 2, 4, 2013, 491-494. (2013). 'pH and Properties of Synthesized Barium Hexa-Ferrite by Co-precipitation Method', International Journal of Bio-Inorganic Hybrid Nanomaterials, 2(4), pp. 491-494.
pH and Properties of Synthesized Barium Hexa-Ferrite by Co-precipitation Method. International Journal of Bio-Inorganic Hybrid Nanomaterials, 2013; 2(4): 491-494. Synthesis of BaFe12O19 magnetic nano particles via precipitation in different pH conditions have been reported. The certain molar ratio of Fe/Ba = 12 selected and sodium hydroxide was used as a precipitant agent. X-ray Diffraction (XRD), Scanning Electron Microscopy (SEM) and vibrating sample magnetometer (VSM) were used to consider the structural, morphological and magnetic properties of barium hexaferrite nano-particles, respectively. Results demonstrated that pH plays an important role in phase composition; so affected sample properties. The broad hysteresis loop shows that the barium hexaferrite powder was in good crystalline nature.